Arsenal legend Martin Keown has reserved special praise for Alexandre Lacazette this season after some fine recent form in front of goal. 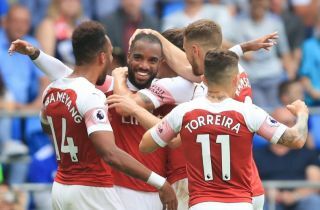 Despite not starting the season as a regular, Lacazette has worked his way into Unai Emery’s first XI of late after some well-taken goals against Cardiff City and Everton. The France international certainly looks to have a hammer of a right foot, looking a very confident and pure finisher when he gets a sight of goal. Keown is pleased with how he’s doing and loves watching the way he strikes the ball, talking in the Daily Mail about how it ‘explodes’ off his foot. ‘We all want to know who is the quickest player in the Premier League, or who covers the greatest distance in a game. But who hits the ball the hardest? Whose shots are the fastest? Who has a cannon for a foot? I suspect Alexandre Lacazette would be up there. ‘The Arsenal forward generates such power in his shooting, he punishes the ball when he hits it. Lacazette had something of a quiet first season at Arsenal when Arsene Wenger signed him from Lyon just over a year ago, but after a year to settle, he looks much improved this term. That’s good news for new manager Emery, who has inherited a struggling side that needs all the quality it can get in the key areas.